We plugged three devices into the USB ports of the KCC Industries USB Outlet Cover at the same time (iPhone at 85% charge, Apple Watch at 85% charge, and an iPad at 65% charge)After 30 minutes, the iPhone and Apple Watch were fully charged, and the iPad was up to 78%!The efficient power output of the KCC Industries USB Outlet Cover allows you to feel confident in knowing that your devices will be charged when you need them most. 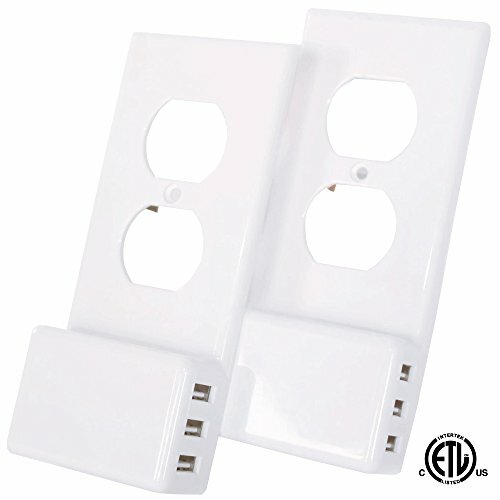 Power off the outlet and remove the existing cover plate using a screwdriverSnap the KCC Industries cover plate in place, ensuring that the power prongs on the backside contact the outlet's conductor wellSecure cover plate using existing screws or the ones providedStart charging your devices! KCC Industries is a veteran-owned business, and we offer a 100% satisfaction guarantee. Items come with a 1 year replacement warranty, and if you are not completely satisfied with your purchase within 90 days, send it back for a full refund - no questions asked!